The federal sequester — the direct result of the 2011 debt-ceiling fight in Congress — has had an immediate effect on jobless workers whose benefits were cut, on the lives of people forced out of Head Start programs and public housing, and on government employees and contractors whose layoffs and lower salaries are preventing economic recovery. 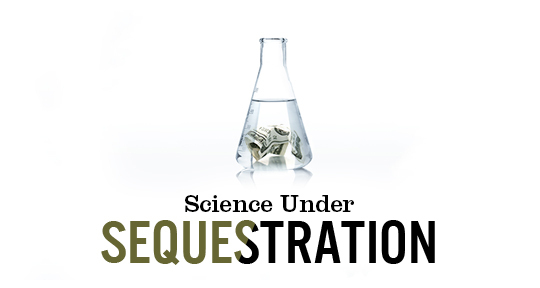 The National Institutes of Health (NIH) and National Science Foundation (NSF) faced an abrupt 5.1 percent cut in this year's spending under the sequester, which has had noticeable impact on scientists at all stages in their career. AAAS MemberCentral spoke with a Ph.D. candidate at Stanford University (who asked that we not include his/her name) about how cuts in science funding have influenced the work of students and professors in academia. AAAS MemberCentral: There has been a significant decrease in the numbers of research fellowships and grants available for scientists. Have you or anyone you know been affected by this? Graduate Student at Stanford University: I only know personally of one group whose funding was completely cut off, but the general atmosphere is a bit more competitive I think; fewer fellowships and grants are available in fields the government is supposedly trying to fund people in (i.e., STEM fields), which I find quite ironic. AAAS MC: How do you think politics plays a role in funding specific projects? Graduate Student: Politics plays a huge role in funding specific projects — the budgets out of the NIH are designed to fund specific interest areas that usually have long-term or direct-clinical aims. Because academic research is somewhat occluded from the public eye, science garners less public attention and sympathy than we would like. As a result, a huge chunk of our funding disappears that would've made a small dent in other government programs. AAAS MC: Do you personally feel as though your research has been hindered by federal funding cuts? Graduate Student: My research has luckily not been affected — but probably due to timing. My graduate program's grant wasn't in jeopardy and I have NSF funding for the next three years. AAAS MC: Many graduate programs have had to cut back on the number of students they accept annually due to sequestration. It's also becoming more difficult for young scientists to find tenure-track positions. Do you find this discouraging in your career? Graduate Student: The academic, tenure-track situation is very upsetting — becoming a successful academic scientist is rather daunting, and the positions at top institutions, even if you get a position, take nearly a decade to get tenure. The demands placed on young PI's are incredible. That being said, I think it's common for people applying to graduate school and people in their first few years to be enchanted by being a PI, but hundreds of Ph.D.s graduate every year and go into a variety of different research positions. However, it's still frustrating that the number of positions will, I expect, continue to diminish unless more funding becomes available. AAAS MC: Do you fear for tomorrow? Do you think the future of research and experimentation is at stake here? Graduate Student: I don't fear for tomorrow, and I think research will continue on, but the quality and amount will suffer in immeasurable quantities. Long-term I think it bodes poorly for economic growth in this country — basic research leads to watershed economic boons, and we should be expanding research to increase the chance of this happening, not reducing it and hoping we are funding the best we can.